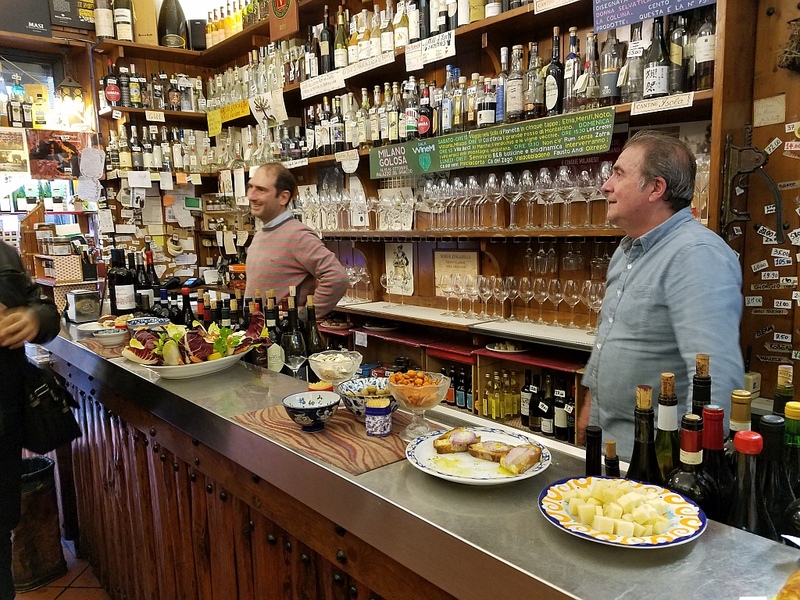 Getting to the Lange, the area where the extraordinary barolo and barbaresco wines originate, is best achieved by flying to Milan, then, staying for a few days of shopping and delicious dining in Italy’s fashion capital. 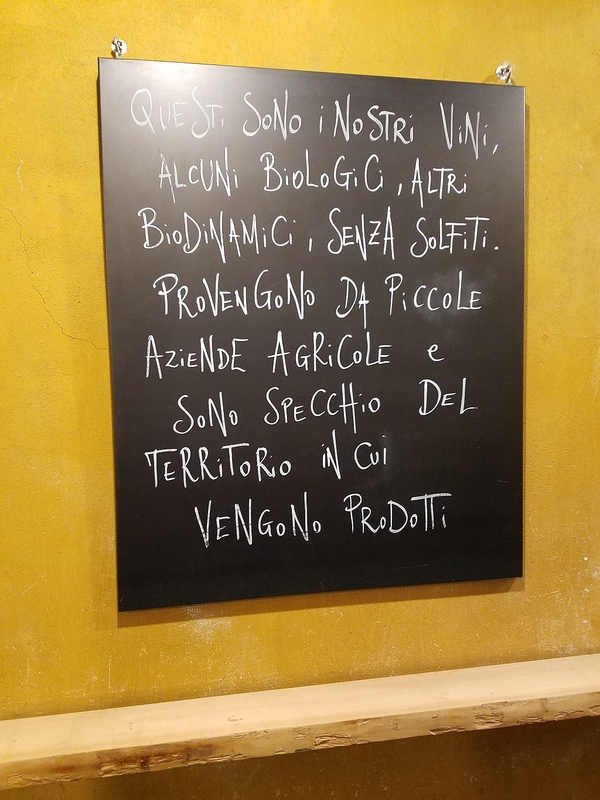 After reading on his website that he never cooks with onion or garlic, it was impossible for me to start my epicurean adventure anywhere other than at Filippo La Mantia. What? A Sicilian chef who does not use the two ingredients in every kitchen in southern Italy? I had to discover what kind of eccentric cook is this man. It was a rainy, late-October night when I arrived at the two-level restaurant, banquet and bar enterprise. Clustered by the front door was a large group of well-dressed guests, through which I excused myself to reach the hostess. She escorted me up the polished stone staircase to the living-room like dining room with its carpeted floor, generous-sized tables and cushioned chairs. From the extensive wine list—stocked with Sicilian bottles—I selected the G.Milazzo, Blanc de Blancs, Brut Nature sparkling wine. It was labeled “metodo classico,” signifying the traditional method produced it. The chardonnay grapes were grown in Sicily’s volcanic soil giving the wine a mineral backbone and bright acidity to its lemon and lime flavors. 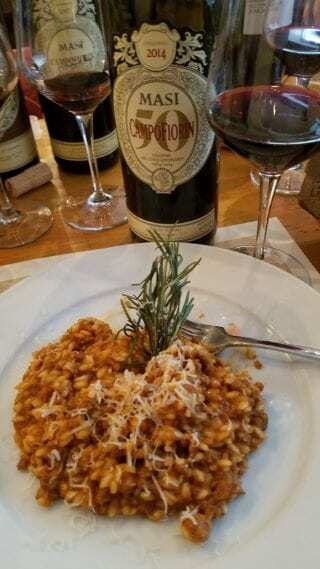 I enjoyed the onion and garlic-less Sicilian eggplant caponata with the very flavorful black-fruit and gravelly 2013 Benanti Serra della Contessea Etna Rosso. Benanti is one of Sicily’s best producers, and the Etna Rosso showed its versatility with a village-size portion of fettuccini with rabbit ragout. Its deliciousness started to make me a believer in the no-onion, no-garlic school of cooking. Tasty zucchini and artichokes propped up dull slices of veal before the hazelnut and chocolate gelato dessert triggered a dopamine avalanche. As I walked towards the staircase, I took in the full room, the private group in the alcove, and at the bottom of the staircase, the crowded bar-café. It seemed the Milanese liked the cooking of this heretical Sicilian chef. I did, too. 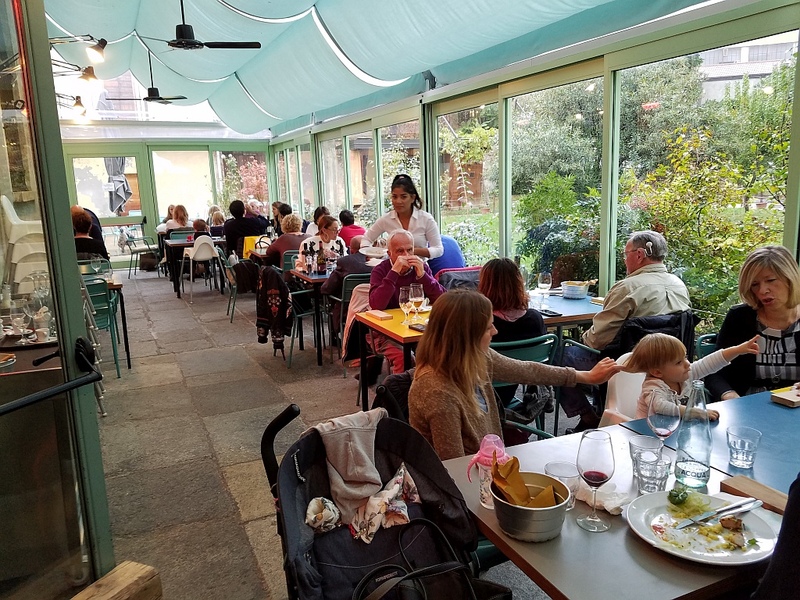 The next day, I walked a half-hour or so for lunch at Cascina Cuccagna’s restaurant, Un Posto a Milano. Located in the Porta Romana section of the city, the farmhouse dates to 1695 and was restored seven years ago with large courtyards, trees, gardens, farmers-market, and a vibrant community linking sustainable lifestyles, urban agriculture and cultural activities. 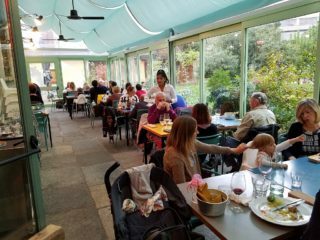 The glass atrium sheltered me from the afternoon dampness and sporadic rain, while the professionalism of the young server—from wine to table service—was striking, given Un Posto’s casual style of colorful metal chairs and tables and exposed brick walls. Its ambience and attitude recalled San Francisco before the dot-com era. My love for Italian cold cuts became more passionate with each bite of Un Posto’s three artisan selections: an 11-month-aged coppa, a 24-month-aged pancetta, and a 3- to 4-month-aged salami. The intensity of the coppa’s pork flavor set a new standard for my palate. And, pancetta—which I have never been able to eat raw—was devoured, leaving a peppery tingle and a desire for more. Only the salami had an equal (and can be found at Manhattan’s Il Buco Alimentari). Three chesses from Lombardy were enjoyable, but my devotion to French cheese was not shaken. Un Posto’s kitchen made the organic-flour rigatoni that was served “alla Norma” with its own twist of pureeing the eggplant for the sauce, then—from some of the 100 organic farms it supports—adding the traditional ingredients of sun-dried tomatoes, ricotta cheese, lemon zest and fragments of basil. The only thing it lacked was a sprinkle of salt, which was easily remedied. The miss of the day was the dry farmer’s chicken that the chef cooked too long—or too long ago. All the other dishes went well with the biodynamic 2014 Arcari + Danesi Brut Zero Franciacorta, my favorite Italian sparkling wine region. On the way out, I toured the second floor where local artists displayed their jewelry, clothing and artworks. The first thing I noticed about the restaurant was the timeless beauty and tranquility created by joining the Reseda green shoulder-high wood paneling in the reception area and both dining rooms with soft yellow wallpaper above it. Then, my gaze was captured by the parade of women of a certain age, as the French say, stylishly dressed in silk and their men in figure-fitting jackets all sauntering to their tables. Later, extremely tall women, whom I assumed were models arrived, cat walking across the room to their seats alongside Millennial escorts wearing jeans,T-shirts and the de rigueur week-old beard. Welcome to Milan and da Giacomo. In such a room, it would be déclassé to do anything other than starting dinner with a bottle of Franciacorta, so with that excuse, I ordered the Monte Rosa Rose Brut Nonvintage. 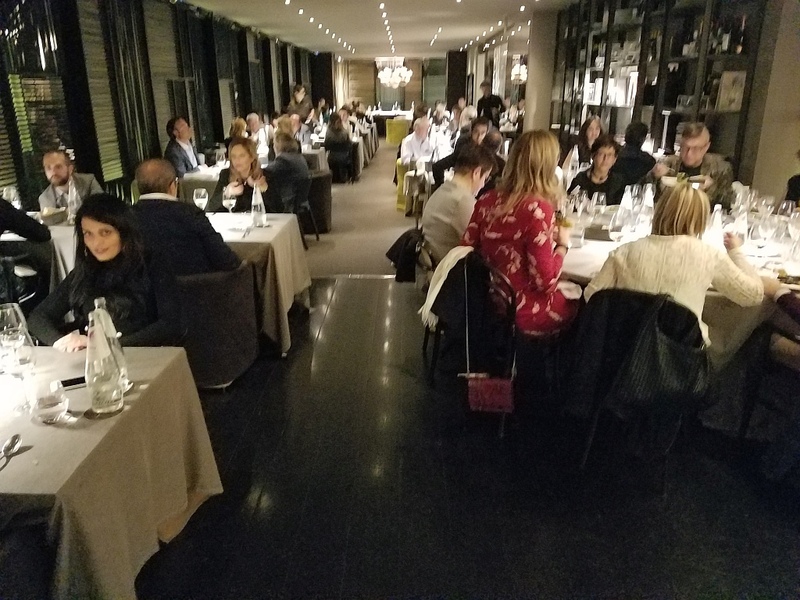 Dining and fish might not be the only reason every table was filled at da Giacomo, but it was mine. Carnivores will find a selection or two at the bottom of the menu; I chose the linguini with langoustines and zucchini flowers from the top. It was delicious. Zucchini flowers appeared again around my turbot and potato gratin. A sheer butter-sauce coated the turbot giving the presentation a French tilt but not too many calories for the well-heeled and thinnish clientele. Dessert is an afterthought at da Giacomo, so I departed for the gelato shop on the square near my hotel. As I stepped into the late night air, two couples walked towards me. The high heels clicked on the sidewalk, the two men buttoned their double-breasted jackets, and the door to da Giacomo opened. 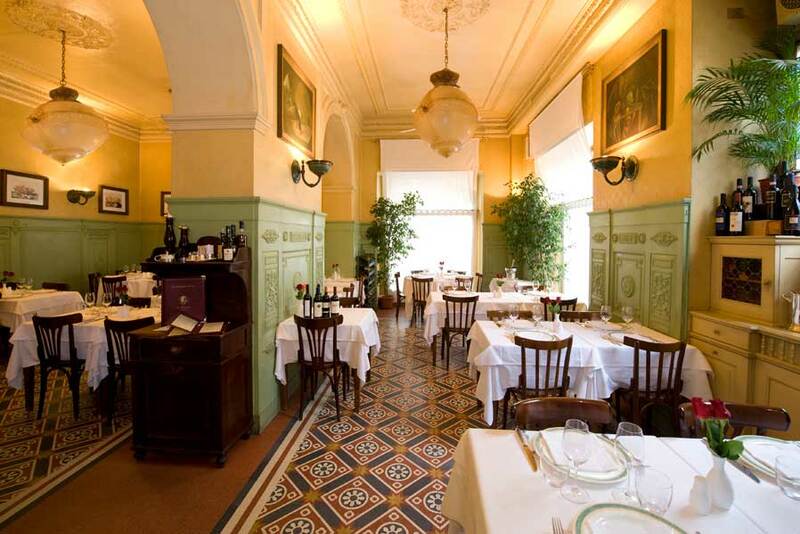 It was Sunday around noon when I asked my hotel receptionist a simple question: where’s a good enoteca for lunch? He said he didn’t know one that was open on Sunday, so he did the most natural thing: He went to Google. 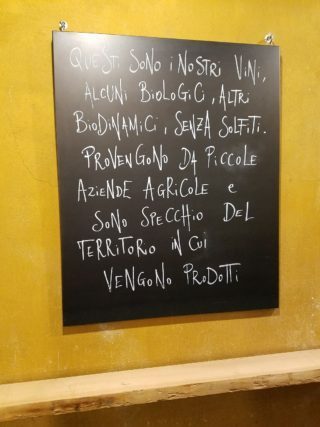 There he found a review in Corriere della Sera Milan’s—and Italy’s—most important newspaper, of the wine bar, Cantine Isola dal 1896. A taxi took me half way across the city before turning into a series of small streets lined with storefronts adorned with signs in Chinese calligraphy. After a few more minutes, the taxi stopped at Cantine Isola wine bar. Its front was wide open and uncorked bottles of wine lined the bar. At the end were plates of meat and vegetable bruschette. Behind the bar was a 50-something-year-old man who boisterously greeted me. Returning the greeting, I asked him if he had a lunch menu. He walked around the bar, took me by the arm and with machine-gun rapidity told me something in Italian while pointing across the street to a line of people. Looking puzzled prompted the two women sitting on Cantine Isola’s outdoor wooden bench to join the conversation. One explained in English that the two Chinese dumpling shops on the other side of the street were excellent and I should buy some, then come back to order my wines and enjoy lunch. It was the first time I ever encountered a wine bar that encourage buying food somewhere else. I choose the dumpling shop to the right, which had a line of about 20 people. 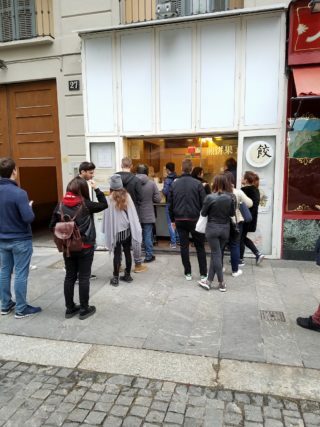 When I reached the window, I saw the sign noting a price of three euros for four dumplings. I purchased both the pork and beef dumplings and carried them back to my outdoor seat. Glasses of Franciacorta, barbaresco, and northern Italian pinot noir were served by my newest friend, the owner, Luca Sarais. The dumplings quickly disappeared, but my hunger remained, so I crossed the street to the other Chinese shop, which, offered chopped meat cooked on a griddle and served in a bun, and shaved pork with onions served in a steamed bun. I ordered one of each. Returning to my bench, I paired them with a glass of Chianti Classico. Meanwhile, Sararis’ cousin, Michael Villanueva, walked around offering black- olive, sun-dried tomato and salami bruschette. 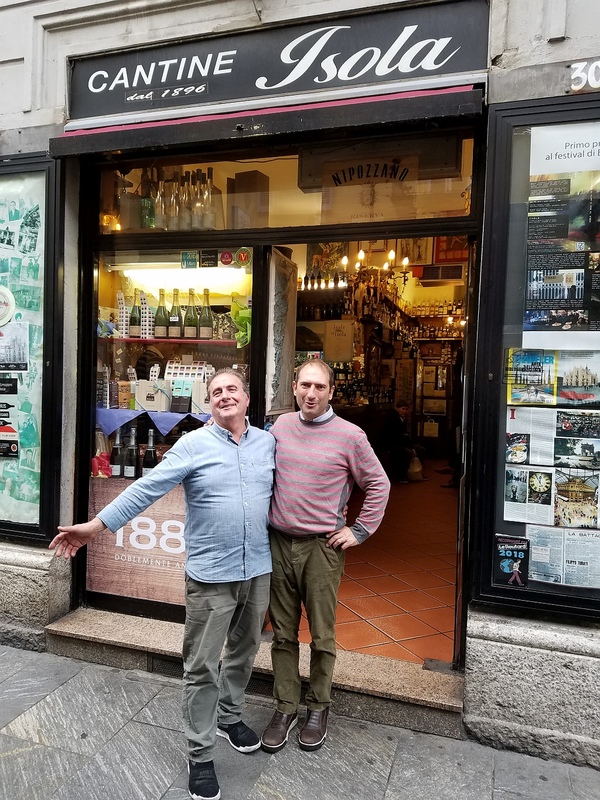 It was now getting colder, my lunch was an unexpected adventure, and Cantine Isola and Milan’s Chinatown created a permanent place in my food and wine travel memory. My friend Luca called the taxi and closed the door for me. “I’ll see you in New York,” he said in English. His smile was no less broad than my own. Next: Part two dining in Alba and the Lange. Bargain is not synonymous with cheap: It’s where quality meets low price. Perhaps, no other country has more of those rendezvous than Italy. Starting in the south and traveling north, I found these bargains in 2018 as well as a few from Portugal, France and California. From Sicily, the 2015 Benanti Etna Rosso with its blend of nerello mascalese and nerello cappuccino, produces a pronounced red-fruit and dried strawberry aroma. It’s a bowl of red berry, blackberry and strawberry flavors bound with tannins and minerality on a medium body. 91 points. Retail $18 to $23. In the Campania region—12 miles from Naples—the Mount Vesuvius volcano has a semicircular ridge called Mount Somma that rises to 3,714 feet. It is there that you find Cantine Olivella, an organic winery established in 2004. Within the winery’s 25 slopeside acres are the white grapes caprettone and catalanesca used for its Lacryma Christi del Vesuvio Bianco. Fermented and aged for three months in stainless-steel tanks, the 2016 Cantine Olivella Lacryma Christi del Vesuvio Bianco has a clear white color and pleasing floral aroma. A very flavorful melon taste with soft acidity and a saline finish makes this wine ideal for seafood. 89 points. Retail is about $15. From central Italy arrives the 2015 Brolio Chianti Classico, which blends merlot and cabernet sauvignon with sangiovese’s bright cherry aroma and flavor. Its medium body holds soft tannins, balancing the red fruit and making it an ideal wine for full-flavored fish, poultry and pizza. 90 points. Priced from $16 to $24. Northern Italy is the home of Gavi often associated with the more than 12 million bottles of insipid, mass-produced wine that are sent to all corners of the earth. But a delicious bargain awaits you in the 2017 Michele Chiarlo Gavi Le Marne. It is an expressive wine: aromas of almonds and white flowers ascend from the glass, and pear flavor glides across the palate, underlined with a dry, slightly saline and lime finish. 90 points. Retail is approximately $18 to $21. Only 4,000 cases were made. The 2014 Masi Campofiorin Rosso del Veronese is the 50th anniversary bottling of this perennial good-value wine. Thirty percent dried grapes were used in this vintage instead of the normal 20 to 25% to counter the amount of rain during the year. It’s visually appealing with clear black-cherry color, and pungent red-fruit aromas show the benefits of the appassimento method in problem years. Delightful raspberry and cherry flavors are carried on soft tannins making this anniversary wine a pleasing celebration. 88 points. Retail prices range from an incredible bargain of $12 to a still-rewarding $20. The 2015 Masi Campofiorin Rosso del Veronese’s red cherry and strawberry aromas and flavors are rambunctiously youthful and the texture similar to some Oregon pinot noirs. Its quality and unusually attractive price calls for putting a case in your cellar. 89 points. Expect to pay about the bargain price as the 2014. Moving along to Iberia, another bargain I found in 2018 was the 2015 Quinta de Chocapalha Castelao Lisboa. Castelao is an indigenous grape that is widely planted in Portugal’s Lisboa and southern regions. Fermented in stainless steel and aged for one year in twice-used French barrels, this bright cherry-colored wine has appealing spicy, raspberry and strawberry aromas and flavors. Its zippy-acidity and red-fruit character make it ideal for pates and short ribs. 89 Points. Prices range from an incredibly low $9 to $16. Bordeaux is not a wine region that most wine drinkers associated with “bargain,” but many white wines from the region are well-made and available at remarkably low prices. Here are three that were fermented and aged in stainless-steel tanks and carry the Bordeaux Blanc Appellation. 2016 Chateau Roquefort comes from a large estate in the Entre-Deux-Mers appellation. While it bears the generic Bordeaux Blanc appellation, the wine itself is anything but. Blending 85% sauvignon blanc with 15% semillon, lively lime and pineapple aromas are matched with pungent lime and lemon-thyme flavors, good balance and a long finish. I’ve tasted many vintages of Chateau Roquefort white wines and this is one more excellent bottling. 92 points. At $12 to $13 buy it by the case. 2016 Chateau La Freynelle blends 60% sauvignon blanc with 20% each semillon and muscadelle, delivering a very citrusy aroma and flavor. Its medium body carries lemon and gooseberry flavors with a dry, mineral backbone. 91 points. Another great choice at $12 to $15. 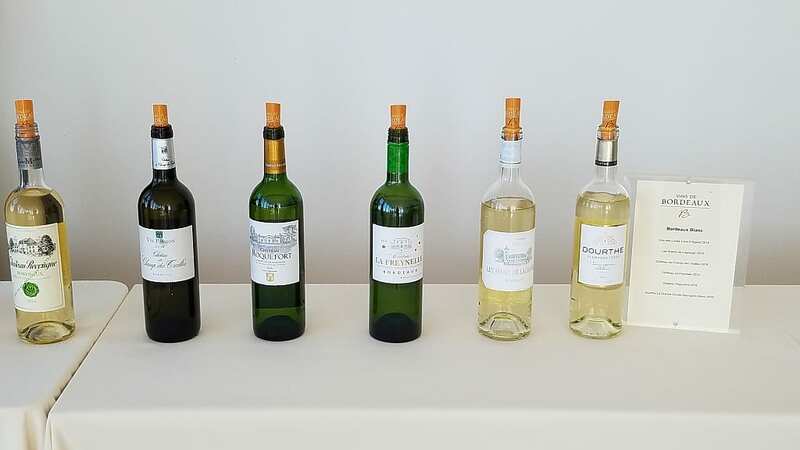 2016 Chateau Recougne is in the Fronsac appellation, but its white wine must be classified under the generic Bordeaux Blanc appellation. Made of 80% sauvignon blanc and 20% semillon, the wine is fermented and aged for one month in stainless steel tanks, then bottled. This clean, quick process preserved sauvignon blanc’s lime and fresh-cut grass aromas. Its lime and thyme flavors have a long, pleasing finish. 90 points. An amazing value at $11 to $15. 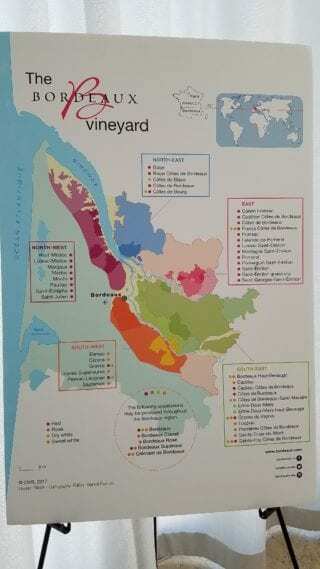 Associating the word bargain with Burgundy is even more incongonous than with Bordeaux. But with some scouting, you can find a bargain like the 2014 Joseph Drouhin Saint-Romain made from grapes purchased from two growers. It has fragrant white flower and pear scents, honeycrisp apple flavor, and a soft acidity bringing complexity and balance. 90 points. Retailing between $18-$20, this is a true bargain in Burgundy. 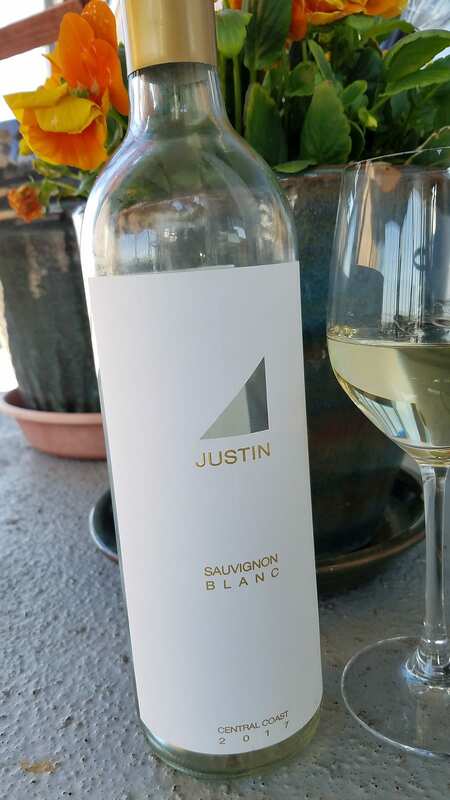 For the most part, California has ceded the bargain wine department to others, but you can find a few like the 2017 Justin Vineyards Sauvignon Blanc Central Coast California. After years of drought, 2017 brought sufficient rain to the central coast vineyards along with record-breaking summer heat, followed by a cool September. The resulting wine has the full mouthfeel of ripe grapes. Its lemon-thyme and white-fruit aromas, melon and lemon-lime flavors are supported with a citrus backbone. 90 points. Its $14 to $19 price tag offers good value. Next Week: the theme continues in Part 2.